The lands to the south of the great river were much wetter but changes have occurred here where the land has become open plains and savannah. This region is now under the dominion of the orcs under their warlord, the Great Khan, Kargun and is impassable to the Kingdom. The orcs constantly raid to the north fighting back and forth across the River Styric, known to the orcs as the Wide Water. The river is narrower to the west and they raid using the river clan’s corsairs and barges across the wider parts of the river and the bay the orcs call the Bay of Blood. Further south the land was always very hot and is believed to be desert but information is sketchy and unreliable. The Orclands are a vast collection of plains hills and river settlements that combine to make up the entire region. There are many different tribes and clans of orcs spread across the area with many differing ways of life but two things bind all these disparate peoples together. The Great Khan and the Demons. Home to the Plains Tribes, the grasslands form the vast percentage of the landmass in the south. The tribes of the plains are roving nomads for the most part following the herds of cattle that they use for food and subsistence. These clans can be vast in numbers with up to a thousand orcs and goblins travelling constantly over the land. The warriors move out before the main body of the tribe on giant wolves that they ride with expert skill, protecting the edges of the group and seeing off any would be predators or raiders from other tribes. Tribes tend to keep to very specific and prescribed routes on the plains and it is very seldom that two such bodies will meet. When they do it can be explosive and violent if not handled properly, with open fighting erupting to determine who is the strongest and has the right to continue on the disputed path. The wildlife in the plains consists of herds of large grazing animals such as yak and long haired cattle and a number of predatory beasts that prey on them as well as on the orcs that farm them. The orc named plains stalker, a canine beast of huge proportion and the bear like ravager are two of a handful of highly savage and dangerous creatures that must be watched for constantly to avoid the loss of tribe members and livestock. There are a number of towns in the region that are populated by orcs who have settled into a more static lifestyle and act as trade towns for the roving tribes. When a tribe enters the town they do so under strict laws of hospitality. To break this hospitality is to suffer a painful death at the hands of all the tribes. The hilly country at the southern edge of the Mountains of Fire is a rocky and treacherous place filled with hazard and peril. Just being this close to that forbidding range of mountain peaks is enough to deter all but the hardiest and toughest of the orc species. It is here that the Mountain Kin-bands make their home. In valleys and cave systems, the Kinbands survive and thrive in this harsh and unforgiving environment. The nature of life and the constant battle against the elements here breeds the strongest and most ferocious of the orc and goblin races. The denizens of these hills have created a civilisation that quite literally relies on the survival of the fittest. No weak orc or goblin could exist here and the Khan prizes these warriors as some of his most vicious and skilled fighters. The homes of the Kinbands are a mixture of wood and hide yurts protected by wooden stockades and the deep cave networks of the mountain ranges. At the center of the deepest caves are the birthing pools. It is here that these Shaman work to create new abominations to strengthen the Khanate, breeding the strong with the strong to create new weapons for the Great Khans war. The River Styric flows across the realm from the Mountains of Fire in the west and to empty into the Bay of Blood in the east. All along this serpentine waterway, the clans of the river make their home. The River Clans live on barges and junkers hardly ever putting a foot on dry land, unless to raid an unsuspecting Alliance settlement. Life on the river is busy on the south bank, with barges and corsairs constantly competing for the best mooring points. The more powerful captains and commodores hold the best positions and the most lucrative spots near the Alliance shipping lanes while other weaker and less influential leaders tend to hole up in more secluded bays and inlets taking what they can. There are three towns on the banks of the Styric. Two of the settlements are run by landlocked families and are the main hubs for commerce in the area. Trade town is the western most town where the foothills rise up to become the peaks of The Mountains of Fire. Aggleston is in the east, sitting on the shore where the river spills into the Bay of Blood. Both of these towns are hubs and are used by corsairs and raiders from up and down the river to trade anything and everything. The third town rests on an island in the centre of the Bay of Blood. Named Port Djangok after the most famous of the river clan corsairs. It is a hive of debauchery and hedonism that is unsurpassed in the Orc Khanate. Modelled on the human style of a port town, Djangok is a place where a river boy can get anything, including very dead if they aren’t careful. 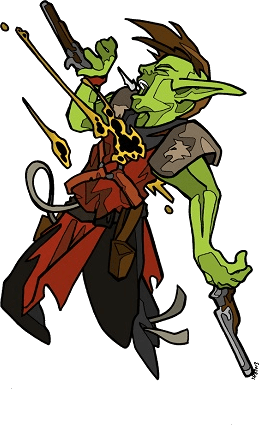 The famous “Armoury of Shooters” is on this island and it is the only place an orc or goblin can get hold of a “quality shooter” this side of The Pit and the tinkers who run the armoury do not sell their wares cheaply. In the center and beneath the Great Plains lies The Pyre. This underground city, hollowed out of the earth and dedicated to the demons that they choose to follow, is a place of power and significance for all orcs and goblins. It bears particular significance to all shaman’s of the tribes. At the center of the city is a tower, a pillar of black obsidian that soars up through the center of the cavern and juts out of the earth creating the marker called the demon stone. At its base, the tower is huge, hundreds of feet in diameter. In its center lies a chamber that houses the eternally burning demon-fire. The Pyre has always been the place where shaman communicated with the demons and has slowly grown over time. Since the Days of Fire, the area around it has become a sanctuary to orcs and goblins. As the Pyre grew, so did the demon stone, shimmering with bale-fire, with the city forming around it. The city is blackened, with a layer of ash and the stench of sulfur. It is laid out in concentric circles, towards the center are ruined buildings, where the land has subsided as the Pyre has grown. Orcs and goblins from all walks of life have resided within the Pyre however it is the shamans of the tribes to which this place is truly important. It is a place of power and true connection to the demons and it is in this place that all shaman are trained in the final rites of their initiation. All of these orcs share a common bond that links them to the Pyre and their unique relationship with the demons. The path that leads to the obsidian spire is bathed in demon-fire. Only those true of faith may traverse the path or else be consumed by it, their souls becoming one with the Pyre and strengthening the demons power. The spire is the temple where ceremonies are led in the names of their demon savior. When it is time to travel to the Vale, the shaman lord, with the help of the demon known as The Enticer, performs a great ritual that opens the portal to the Vale. He holds back the veil of fire so that those who have been chosen may travel safely through regardless of whether they are shaman or not. Once through, the shaman connects the Vale to the Pyre using the black mirror. Once activated this conduit connects the demons of The Abyss to the Vale and allows them to speak to their followers through the Shaman, giving aid and advice or admonishment and scorn depending on the situation. In the center of the Plains there is a great place of power. It has been erected with the guidance of the shaman as a way to honor The Demonic Pantheon. The demon stone is a single polished shard of black obsidian that soars approximately one hundred feet into the air. It is only the tip of a larger structure however, the root of this epic piece of shamanic engineering goes deep below the surface to the Pyre below. It is this stone that marks the entrance to the underground caverns that house the Temple of the Anointed. It is here that all initiated orcs and goblins are brought to undergo the final trials before they are able to call themselves worthy of the mantle of shaman. When the Pyre is at the height of its power, the demon stone glows with a magical energy and the Shaman climb to the pinnacle and blow the great horns, summoning the horde to compete in the Great Naddams.